Pets Costs > How Much Do the ATM Tanks Cost? How Much Do the ATM Tanks Cost? ATM tanks, which are created by Acrylic Tank Manufacturing, created unique tanks on the hit TV show, Tanked, a reality hit television show on the Animal Planet. These tanks, because they are customized, are much different than the traditional fish tanks you’re used to seeing in a home or doctor’s office. From an aquarium inside a telephone booth to one that dispenses wine, they claim that if you can dream it, it can become a reality. How much does a custom ATM fish tank cost? The costs, since the aquariums can be customized to your liking, can be all over the place. On this Reddit.com Ask Me Anything page, Wayde King and Brett Raymer, the guys from the actual show, said the costs could be anywhere from as little as $30,000 to more than $300,000+ brand new. They also mentioned they had build aquariums that cost well into the millions of dollars. 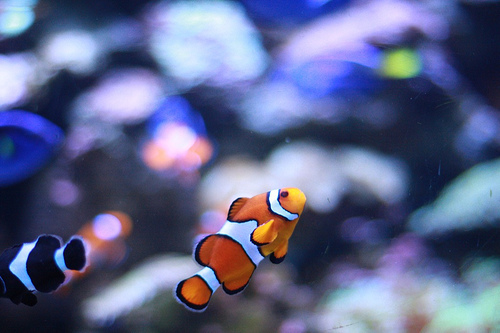 The costs, if you were to hire them, would virtually be endless and highly unique since every aquarium would be different, but if you were to hire these guys, it’s safe to say you would have to budget at least $30,000 to $60,000 to start with something basic and work your way up from there. Someone on a lasvegasbadger.blogspot.com thread claimed they hired ATM to have an aquarium installed. Their 250-gallon aquarium, installed inside of the wall, cost them close to $28,000 after installation. The owner of All Star Wine & Spirits had the television show install a 650-gallon fish tank shaped like a wine bottle, which was higher than 17 feet, for $100,000, according to the timesunion. In this Tropical Fish Magazine article, they created a 32 foot tall and 11 foot in diameter fish tank for $1.6 million. This particular fish tank was designed inside of a four-story private home, where the home was built around the aquarium itself. Tracy Morgan’s at-home shark tank, quite possibly the most popular tank on the show, was reported to cost close to $400,000 to install. Marshawn Lynch and Dwight Howard’s fish tank would have apparently cost close to $60,000 to build. Shaq, yet another celebrity who participated on the show, was said to spend $50,000 on his customized aquarium, which weighed close to 3,000 pounds. According to Wayde, the company is known for its “turnkey” process, which includes everything from the fish tank, the stand, all of the woodwork required, the facade, the filters, the pumps, coral inserts, and in some cases, they will even stock the fish. To date, they are the #1 custom-shaped fish tank manufacturer and will install anywhere in the world. With a specialized in-house oven, designed to bend acrylic, they can shape virtually any piece into something you desire. This in-house tool enables them to make tanks as large as you desire and even fit them inside the tightest and most unique shaped spaces. The costs aren’t done once the tank is built. As with any aquarium, maintenance and cleaning is required to keep the tank in tip-top shape. As a daily routine, this can include observing the fish, ensuring the equipment is working, checking the temperatures and topping off the water levels. Weekly, you will need to wipe down the outside surfaces, scrape the inside glass, shake any debris off the plants and partially change the water. Each month, water tests for pH, ammonia, nitrite, and nitrate, are crucial to ensure nothing unseen is brewing. The filters will need to be changed, and in some cases, the light bulbs will need to be replaced, the tubing will need to be cleaned and the filter intake will need to be inspected and cleaned as well. Depending on the size and complexity of your setup it’s safe to budget $1 per gallon if you were to hire a professional. Electricity bills, depending on your setup, could increase by the hundreds if your tank was able to hold hundreds of gallons. As a safe measure, it can cost close to $20 per month per 100 gallons. Stocking the fish, as time goes on, needs to be considered as well, especially when some of the fish die off.